KIEV, Ukraine -- The Ukrainian government is implementing austerity measures in the armed forces by cutting the number of military personnel by 20 per cent over the next five years, Russian news agency RIA Novosti quoted Ukraine's Chief of General Staff Gen. Hryhoriy Pedchenko as saying on Thursday. Ukrainian military cadets march during the parade at the main street in Kiev. As a result, the strength of Ukrainian military will come down to 160,000 by 2015. Kiev's drive to reduce military expenditure will cost 40,000 defense employees, including high-ranking officials, their job. The cuts will equally affect both servicemen and civilian personnel. 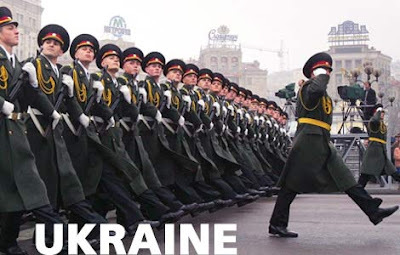 Currently the Ukrainian armed forces employ 200,000 people. Gen. Pedchenko said the major cut-backs begin with the General Staff, followed by the dissolution of "unnecessary" logistics support units. He also revealed a plan by the Ukrainian Defense Ministry for military alliance with NATO next year. A proposal of more than 20 NATO-Ukraine joint projects has been submitted to the President. However, it is not sure if pro-Russian President Viktor Yanukovych, who opposes alliance with NATO, will approve the military cooperation.